True collaboration is a delicate balance between the individuality of the contributing artists and the resulting synergistic relationship that forms while sharing the same artistic direction. While artists who delve into the surrealist world of “the exquisite corpse” are blind to the preceding and successive contributions of their creative companions, the six musicians who form Sacramento’s Exquisite Corps are keenly aware that their interdependence is what defines the band’s sumptuous aesthetic. The big reveal at the conclusion of the exquisite corpse inevitably results in a disjointed and nonsensical image from the collaborating artists, and expectantly so, since a cohesive end product cannot be created in a vacuum in piecemeal fashion. The finished product of the six musicians in Exquisite Corps is quite the opposite. Guitarist/singer Bryan Valenzuela most often takes the laboring oar when it comes to conceptualizing melodies and putting those melodies to paper. 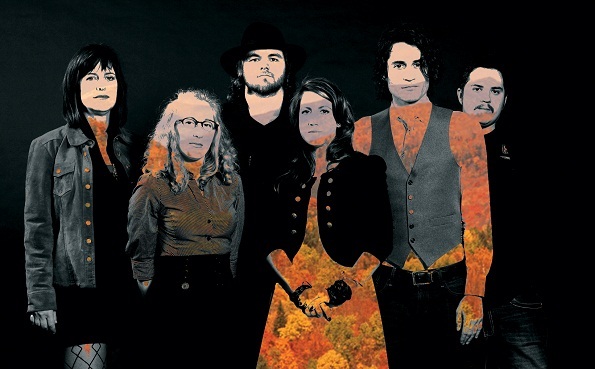 But throughout the creative process, ideas are vetted through the other five members of the band, cellist Krystyna Taylor, violinists Reylynn Goessling and Kristin Arnold, bassist Nate Webb, and drummer Robby Dean, each of whom leaves their individual stamp on what we the listener hear as the final product. Naturally, the songs on the band’s upcoming self-titled debut album feel organic in creation yet cerebral in approach as Valenzuela, Taylor, Arnold, and Goessling all studied music, with the latter two classically trained in violin. The band conveys a distinct point of view in their self-titled debut album. Just listen and you’ll understand who this band is and where they are going. Valenzuela’s howling vocals evoke little dark and dreary images out of the corners of your mind. The rhythm section of Webb and Dean provide a solid anchor to the members of the string section who enrich the moodiness of the song with each emotional pull of the bow. Fans of Oklahoma’s Other Lives or multi-instrumentalist Andrew Bird should definitely take the time to check out this hidden gem of a band called Exquisite Corps.